A town of South Lanarkshire with a population in excess of 15,000, Larkhall lies 4 miles (6.5 km) southeast of Hamilton and is bordered by the Avon Water to the west and the M74 motorway to the east. Formerly known as Laverockhall, Larkhall was famous for its mining and weaving industries, while today the town employs people in the electronic, electrical and engineering industries as well as high street and tourism. The disused Larkhall Viaduct is the most notable landmark of the town and, at 53.3m (175 feet), the highest railway bridge in Scotland. Larkhall Railway Station opened in 1905 closed in 1965, but re-opened in 2005 on the new Argyle Line. The town now benefits from a second station at Merryton on the same line. Larkhall has six primary schools and one secondary (Larkhall Academy), several churches, a library, leisure centre, and a group of industrial estates to the south. Much has been done in recent years to change Larkhall's unfortunate reputation for sectarianism. This reputation came about through the use of Irish immigrants to break strikes in the mines. The town became notable for Unionism, Protestant marching bands and support for Rangers Football Club. 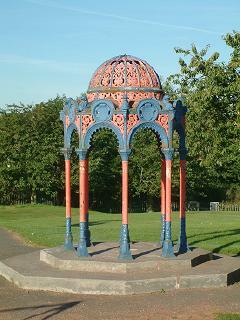 The townspeople painted park railings and other public structures in orange and blue. The colour green - seen as a symbol of Catholicism and the rival football club Celtic - is notably absent. Green traffic lights have to be protected by metal cages and several national retailers have chosen to remove the colour from their corporate branding in the town.